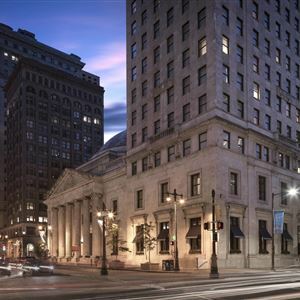 Property Location With a stay at The Ritz-Carlton, Philadelphia, you'll be centrally located in Philadelphia, steps from Free Library of Philadelphia and minutes from City Hall. This 5-star hotel is close to Liberty Bell Center and Independence Hall. Rooms Make yourself at home in one of the 301 air-conditioned rooms featuring minibars and flat-screen televisions. Pay movies and video-game consoles are provided for your entertainment, with wired and wireless Internet access available for a surcharge. Bathrooms have designer toiletries and hair dryers. Conveniences include phones, as well as safes and desks. Amenities Relax at the full-service spa, where you can enjoy massages, body treatments, and facials. You can take advantage of recreational amenities such as a sauna and a 24-hour fitness center. Additional features at this hotel include complimentary wireless Internet access, concierge services, and babysitting/childcare (surcharge). Dining Grab a bite to eat at the hotel's restaurant, which features a bar, or stay in and take advantage of 24-hour room service. Quench your thirst with your favorite drink at a bar/lounge. Buffet breakfasts are available for a fee. Business, Other Amenities Featured amenities include a business center, express check-out, and complimentary newspapers in the lobby. Planning an event in Philadelphia? This hotel has 26000 square feet (2415 square meters) of space consisting of a conference center and meeting rooms. 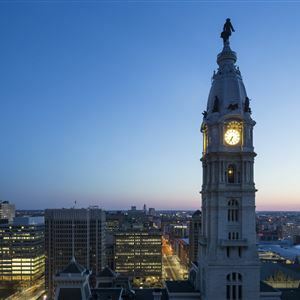 With a stay at The Ritz-Carlton, Philadelphia, you'll be centrally located in Philadelphia, steps from Free Library of Philadelphia and minutes from City Hall. This 5-star hotel is close to Liberty Bell Center and Independence Hall. Make yourself at home in one of the 301 air-conditioned rooms featuring minibars and flat-screen televisions. Pay movies and video-game consoles are provided for your entertainment, with wired and wireless Internet access available for a surcharge. Bathrooms have designer toiletries and hair dryers. Conveniences include phones, as well as safes and desks. Relax at the full-service spa, where you can enjoy massages, body treatments, and facials. You can take advantage of recreational amenities such as a sauna and a 24-hour fitness center. Additional features at this hotel include complimentary wireless Internet access, concierge services, and babysitting/childcare (surcharge). Featured amenities include a business center, express check-out, and complimentary newspapers in the lobby. Planning an event in Philadelphia? This hotel has 26000 square feet (2415 square meters) of space consisting of a conference center and meeting rooms.